Heat ghee in a kadai and fry the cashews for few seconds. Add the dessicated coconut and fry for few seconds. Then add the semolina or rava and fry on very low flame for few minutes to make sure it is roasted well. Add the sugar and give it a nice mix. Then add the milk and keep stirring till the mixture becomes fluffy. Turn off the flame and rest the mixture for few minutes. 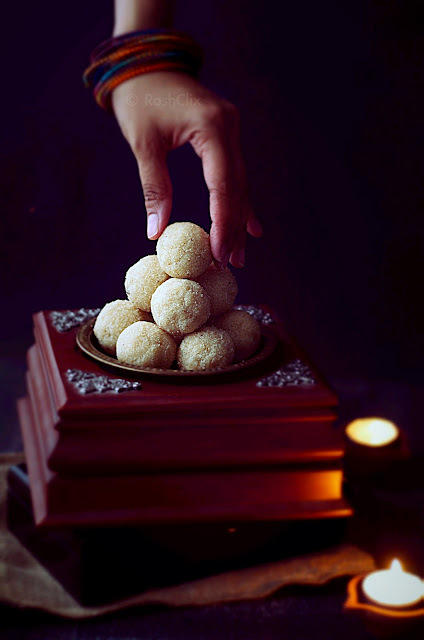 While it is still warm to touch, roll it into medium sized individual balls (make sure your hands are greased with ghee or butter) and leave them on a flat plate for couple of hours. Your rava ladoos are then ready to be savored! Ladoos look perfect, adding coconut shud have made it even more tasty.. These look great! I have never tried this, but want to try now! it's my mom's bday dish , we always had it when we were all together in india. WOW! !One of the best rava laddo I have seen so far! Mouth watering!